Properties in Leon Sinks Geological Area average 4.7 out of 5 stars. Property 1: Live Oak Cottages In town! Beautiful Live Oak Trees! Cozy! Property 4: Your FSU Game Day Space/ Walking Distance to Doak! Property 5: Live Oak Cottages In town! Beautiful Live Oak Trees! Cozy! Property 9: Walk to Doak from this FSU Game Day Hot Spot! Property 10: Spacious 3BDR/3BATH Perfect for Seminole Game Day! Property 13: Your FSU Game Day space! Property 14: City loft in the heart of downtown Tallahassee! Luxury in the heart of Tallahassee! Property 17: Luxury in the heart of Tallahassee! Property 18: Walk to Doak from this FSU Game Day Hot Spot! Property 19: Spacious 3BDR/3BATH Perfect for Seminole Game Day! Property 20: 3BDR/3BATH The Best Location for FSU Game Day! 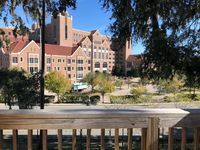 Property 21: Your FSU Game Day Space/ Walking Distance to Doak! Walk to Doak Campbell in minutes! Property 23: Walk to Doak Campbell in minutes!